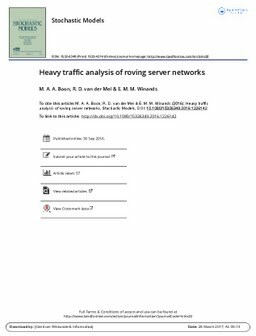 This article studies the heavy-traffic (HT) behavior of queueing networks with a single roving server. External customers arrive at the queues according to independent renewal processes and after completing service, a customer either leaves the system or is routed to another queue. This type of customer routing in queueing networks arises very naturally in many application areas (in production systems, computer- and communication networks, maintenance, etc.). In these networks, the single most important characteristic of the system performance is oftentimes the path time, i.e., the total time spent in the system by an arbitrary customer traversing a specific path. The current article presents the first HT asymptotic for the path-time distribution in queueing networks with a roving server under general renewal arrivals. In particular, we provide a strong conjecture for the system’s behavior under HT extending the conjecture of Coffman et al. [8,9] to the roving server setting of the current article. By combining this result with novel light-traffic asymptotics, we derive an approximation of the mean path time for arbitrary values of the load and renewal arrivals. This approximation is not only highly accurate for a wide range of parameter settings, but is also exact in various limiting cases.